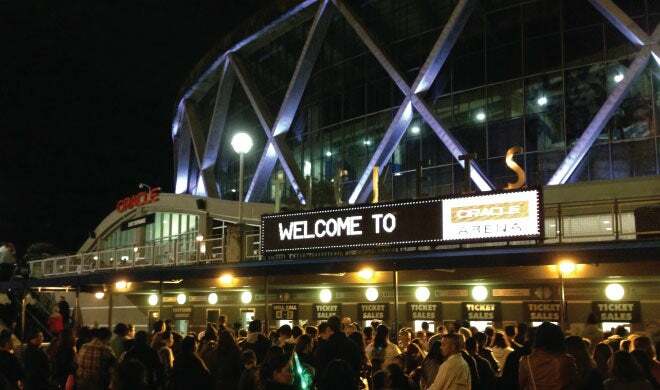 Tickets to Oracle Arena and Oakland-Alameda County Coliseum events can be purchased at the venue’s main box office located on the main plaza level between the two venues. PLEASE NOTE: Customers may use their major credit card (with EMV chip only), or cash in the form of $100, $50, $20, $10, $5 and $1 bills at the box office windows. We also offer an ATM machine on our plaza. There may be select ticket prices or certain events altogether that may not be available for purchase at the box office, based upon ticket availability or ticket delivery restrictions. Please check the specific event listing for detailed ticket sales information. Children 24 months or older need a ticket to events. We accept cash, Visa, MasterCard, American Express and Discover for ticket sales. Absolutely no camping out in the parking lot. No one is allowed on the property prior to 7:00 AM. You should plan to arrive no more than one hour in advance of the event on-sale time. We reserve the right to refuse ticket service to anyone who does not abide by the above ticket policy. A Random Number Distribution (RND) procedure will be used to determine line order if two or more customers are present to purchase tickets at the time the event goes on sale. Guests picking up tickets at “Will Call” are required to show a valid photo ID in their name. The name on the valid photo ID must match the name on the will call ticket envelope. No exceptions to his policy can be made. Closed Saturdays, Sundays & Holidays on non-event days. Closed Saturdays, Sundays and Holidays unless there is a scheduled event. Closed Sundays & Holidays on non-event days.